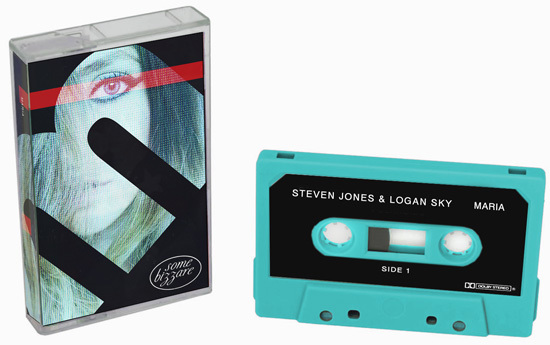 When we last checked in, ex-Visage synth player Logan Sky was two EPs into a partnership with vocalist Steven Jones with cassettes/DLs available at their Bandcamp page. That was then and this is now. The duo report that their songwriting is not moderating and the first EP new material this year is cued up for an August 19th release, this time under the imprint of the legendary Some Bizzare label. Can it be that your friendly, neighborhood Monk is writing about music to be consumed in DL format two posts in a row?! Do not adjust your sets! It looks like the 21st Century is finally beginning in earnest for this not so young man. The first song here, “Maria” actually is a re-dux of an earlier song dating back to 2012 and Logan Sky’s Saar + Sky project. The difference here was not only was Steven Jones the singer but the Italodisco quotient of the original was moderated here to a more introspective early Depeche Mode vibe. The bell-like clarity of the synths recall the almost late 60s vibe that I enjoyed to well on “A Broken Frame” and have waited for 34 years for someone else to pick up the threads and continue forward with them. Depeche Mode were definitely the touchstone for this EP with Steven Jones vocal phrasing bearing the influence of early David Gahan. The next track featured another Visage veteran, Lauren Duvall, performing the song as a full on duet with Jones and her presence on the track as both co-lead and backing vocalist lend this throbbing slice of electro a complex character that I would like to see Jones + Sky pursue further going forward. Ms. Duvall’s ethereal b-vox hit a lovely note her of crepuscular melody that fans of Gazelle Twin would surely enjoy. This entry was posted in Record Review, Want List and tagged 2016, Logan Sky, minimal synth, Steven Jones, Visage. Bookmark the permalink.